Power in the social media world is held by those who can hook mass attention and change individual’s PERSONAL preference. That’s right, a messiah of followers can preach thoughts and ideas that their followers talk about. That’s what a brand wants: to be talked about. Delving into deeper strategic social media, these brands sometimes want a specific targeted audience of potential consumers or mass followers depending on their message, product or service they are selling. Social Media is not just a platform to showcase your selfies. Social Media is a marketing platform where businesses can talk to consumers, businesses can talk to businesses, and consumers can talk to consumers. The end goal is the SALE. Selling your brand image, selling your lifestyle, selling your product, selling your knowledge, selling your service. Whatever it is you want to sell at the moment, big corporate companies and small niche brands are trying to figure out the best way to market themselves through the ever growing population on Instagram, Twitter, Facebook, Pinterest, Snapchat, LinkedIn, Periscope. Whether it is authentic or fabricated, the effect of emotions on the human mind reflects the number of hits on viral videos and ad campaigns. Love, Terror, Awe, Shock, Amazement, Laughter, Disgust, Anger. What do you normally click on when you scroll through friends Facebook pages….Baby Animal videos, stunt videos, funny videos, scary videos? It’s interesting that the more and more we become physically detached from people, sitting in front of our screens (as I am doing right now), or using the power of touch to type each other Whatsapp messages, Facebook messages and emails, the fact is the core need for emotion remains. Through all this technology, we remain human. Human behavioural patterns, traditions and values may change but core emotions stand integral to most humans’ functionality and basic instincts. So let’s take a look at this video below. A woman buys a Chewbacca masks, puts it on and laughs at herself. She’s not only in awe of herself, she thinks it’s amazing, fun, and the sincerity of her laughter makes us the viewer feel that it has touched her inner child. How does she do that? Who taught her how to light the video correctly, laugh like that, did she have lines? Of course not. She was being human and that human reaction captured the hearts (and video and the 6,283,233 video clicks). She captured more than four million people in the world in a four minute video. This capacity to touch humans emotionally got her invited to huge entertainment platforms like the James Corden show and Good Morning America. 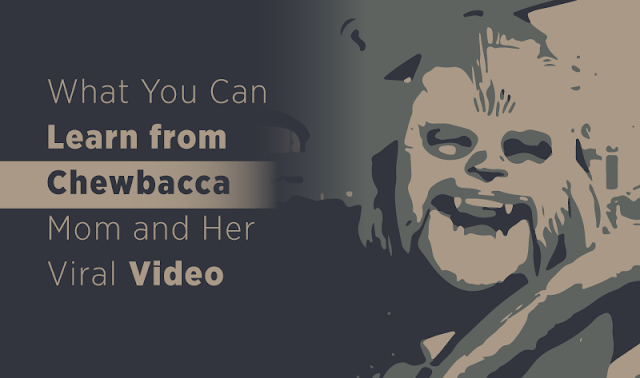 There is hardly anyone in the United State who hasn’t seen or heard about the “Chewbacca Mom”, such a simple video that has taken the Internet by storm and has instantly made her what brands and marketers term as “Influencer”. It’s impossible to launch content without an influencer on marketing strategy these days. Big brands have immediately tied themselves to this viral sensation. So, the question is what brands and marketers can learn from this video? And the million-dollar question on “How can brands or marketers increase the discernibility of their content? Here are the lessons that brands and marketers learn from this “Chewbacca Mom” video. The power of genuine and truthful in influencer marketing in action creates an emotional connection with your audience. Speak from your heart; spend more time creating meaningful sincere connections with influencers or ambassadors and people. Unintentional as it was from the video, the moment speaks the truth. Share your brand story within a truthful way, as consumers don’t want brands to tell them what to buy but people whom they trust. It is a delicate line to walk, as you don’t want to be come across as insincere and fake. Be positive and try to build your campaign on honest emotions. Subsequently, it will help foster similar grasp of your brand. The video proven the tremendous power of social media and people like to see heartwarming messages and sincerity from others. Some campaigns are heartbreaking and others are hilarious. Even when it’s heartbreaking, the message behind the campaign is with positive emotions resonate. Brands and Marketers can draw an important lesson from these examples of viral media hits. One aspect of this viral video is such a success, it’s because it draws people’s attention and their affection. It’s simple and a joyous moment that captured the heart of millions. Hence, the story does not have to be complicated; the key to achieving success is often built emotional connection with your audience with simple positive images. There are only so many times you can put on a Chewbacca mask and laugh for the cameras and cashing on viral stardom. You need to create a brand of your own right, tell your story, built a personal brand and most importantly, brands and marketers need to have fun when conveying their story on social media. Want to capture your audience using social media? Find your own Chewbacca mask. For more information about digital marketing, please free to contact Jessica Patterson.